Yoga originated in India and was introduced in the United States in the late 1800s and early 1900s when Yoga masters traveled to the West. 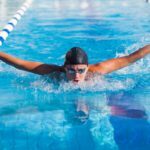 Since then it has become hugely popular, mainly because of its focus not only on the physical training but on the spiritual and mental discipline side as well. Yoga will improve your overall strength, muscle tone and flexibility, and the use of meditation has been proven to increase metabolism, lower stress and improve brain function. If you want to get the most out of each class, you will need to carry with you all the necessary Yoga accessories and there is no better way to do that than to have a Yoga bag that will keep all your gear organized and accessible. Pros: Extra large bag that will comfortably fit large and thick Yoga mats. Made from a sturdy nylon canvas. Cons: Strap attached to a plastic loop that may break over time. Stickier mats are hard to pull out. Bottom Line: Nice bag with a classic design and enough space for Yoga gear. Pros: Unique double ventilation system. Large, with 4 multifunctional storage pockets for all your gear. Cons: Can't handle the weight of large mats plus additional Yoga accessories. Not comfortable – the strap's metal pieces will scratch your back. Bottom Line: Ideal for light Yoga mats or when you store your mat at home. Pros: Solid sling bag, thick, strong material. Large, with 5 multifunctional storage pockets for all your gear. Cons: The open end ventilation system won't protect your mat and towels from bad weather. The Velcro straps can leave marks into the mat. Bottom Line: High quality sling bag with plenty of space for all your Yoga accessories. Pros: Front pockets specifically made for Yoga blocks (9"x6"x4"). Great for heavy, sticky mats, as it is easy to slide them in. Cons: Uncomfortable to wear as a backpack; the straps are too loose. Will only accommodate a Yoga mat of up to 26" x 85". Bottom Line: Great 100% waterproof bag which will accommodate both heavier mats and your personal items. Cons: Won't fit large mats like Manduka Pro. Poor quality stitching- the bag might rip apart if you overload it. Bottom Line: A very light bag for a standard sized Yoga mat and small personal items. 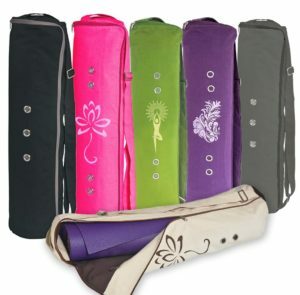 Yoga Addict’s Yoga Mat Bag Comes in Many Different Colors. Yoga[Addict]™ is a relatively new company in the Yoga gear industry. Their Yoga[Addict]™ Large Yoga Mat Bags are made from 100% Premium Polyester which has a nylon canvas feeling. 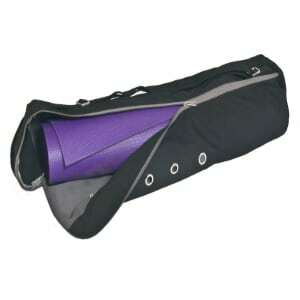 The material is sturdy and lightweight, which makes it ideal if you want to carry both your Yoga mat and accessories. The bag is lined inside with a fine moisture-resistant coating that is easy to wipe and clean. On the downside, the material is not 100% waterproof and it will shed a bit of water during heavy rains. In addition, it has 4 ventilation eyelets to prevent odors. The zippers work, stay closed and won’t catch the material. 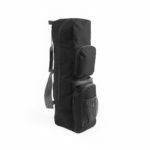 The bag is 28”x8” and will comfortably fit large Yoga mats of up to 26”. It comes with a comfortable 1.5” shoulder strap which can be adjusted according to your height or preferred carrying position. Yoga[Addict]™ also offers one medium mesh pocket on the inside and an extra pocket on the outside to allow you to carry your wallet, keys, cell phone, glasses, and documents. The design is unisex, simple and it comes in a variety of colors, from black to pink and yellow. Yoga[Addict]™ is priced at around the $20 mark. It is one the lower priced bags from our top five yoga mat bags, but don’t let the affordability fool you as this bag won’t rip or tear from prolonged use, thereby providing an excellent balance between quality and price. Yoga[Addict]™ is easy to carry around, whether you are looking to bike or walk to the gym, and, compared to other items on this list, it won’t leave any marks on your shoulders. The only problem would be that the strap is fixed on one end and clips onto a plastic loop at the other end of the bag. Breaking the strap connectors would render the bag useless. 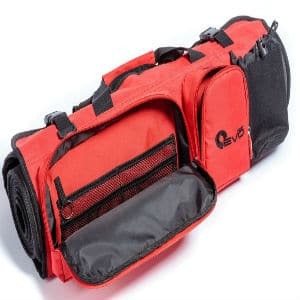 The bag is also one of the largest on the market and depending on the size of your Yoga mat it allows you to carry small Yoga gear (bottle of water, Yoga socks, gloves and light training clothes). On the other hand, if you decide for a large Yoga mat like the Manduka Pro Mat (71″x26″), you won’t have much space to fit anything else. Stickier mats like Lululemon or Jade might also be difficult to pull out because of the interior lining which will make them stick to the bag. If you are in a hurry, this bag is easy to pack and unpack at the start/end of the Yoga session. 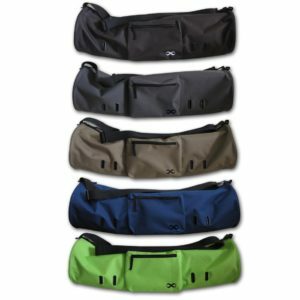 The Gecko Active SMART BAG is made out of 100% cotton canvas and comes up in a variety of colors. The material is very light, soft and sturdy with solid zippers. It has an ‘L’ shaped zipper which will allow you to fully open up the bag. The stitching on the bag we’ve got is not great, you can see a few stray strings, but the bag doesn’t look like it will come apart and the inside lining offers additional durability. Gecko’s SMART BAG is a bit smaller than the Yoga[Addict]™ (28” x 7”) but comfortably fits the majority of the Yoga mats. It has a dual air flow system: 4 eyelets which will ventilate the large inner pocket (for your wet towel) and a double mesh bottom on the side of the bag, which will ventilate the mat and the inside of the bag, preventing mildew and facilitating evaporation. It has 4 multifunctional storage pockets for all your gear: one nice, large, inside pocket which extends nearly to the length of the bag for your water bottle, towel and some additional small Yoga gear (shirt, Yoga gloves and socks), one medium size pocket (for keys, cell phone, wallet), one small pocket on the side for other small personal belongings and a very small pocket at the bottom of the bag, near the handle, which won’t fit much – maybe keys or some money. Priced around $25 it has a similar price as other yoga mat bags on our list, but it seems to be a bit overpriced for what it offers, especially since you can’t carry any heavy items in this bag. Given that other Yoga mat bags offer greater storage space, the Gecko Active SMART BAG is not the best value on our list. Gecko’s SMART BAG will slip off your shoulder when you carry it. Unfortunately, the metal pieces that adjust the strap’s length are pointy and will scratch your shoulders, which makes it painful to wear. The strap also doesn’t seem to be properly sewn into the bag and it might not be able to handle the weight of large mats plus additional Yoga accessories. This bag is not as spacious as expected. Like the Yoga[Addict]™, it does NOT hold a Manduka Pro Mat, but it seems to comfortably fit a Manduka ProLite or 24” wide standard mats. Yoga mats made out of a stickier material will get caught in the material of the bag. The pockets are good only for flat items. A water bottle will make it hard to fit in your Yoga mat. It is made specifically for a dry climate/summer days as the cotton is not waterproof. The Yoga EVO Yoga Mat Bag feels like a very solid bag. The material (nylon fabric) is thick, strong, without tears or loose threads, the inner lining looks to be in good condition as well and all of the zippers work easily. The bag is equipped with 5 pockets of various sizes: – one large inside pocket for your clothes; – one large external pocket (with foam protection) with 4 small mesh pockets + 1 keyring for your keys; – one pocket for your headset, cell phone, or wallet with a slot where your headphones can go through; – one bottle holder for a small bottle; – one small pocket on the back of the bag for other small belongings; Yoga EVO is an open-end bag which doesn’t cover the entire mat. Its unique ventilation system allows the mat to stay fresh and clean. The mat is held in place with two adjustable Velcro straps which allows you to safely carry any brand and any size Yoga mat along with your Yoga towel. You also have the option to carry this bag using the adjustable shoulder strap or switch to the two carrier handles. Yoga EVO costs about $30 and is one of the most affordable yoga mat bag options available. On the other hand, the higher price could be justified by the additional space offered and the high quality of the materials used. 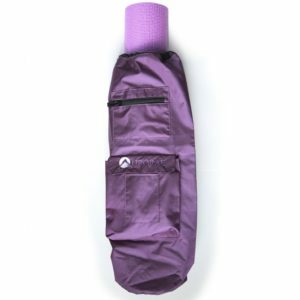 Whether this yoga bag is a good value will depend on each individual’s budget and needs. Yoga EVO is more like a sling with many pockets. Due to its open end your mat won’t be fully protected from the rain. You can easily roll your Yoga mat with a towel and you will even have plenty of space to organize all your Yoga accessories, but it will be a bit difficult to fit in thicker Yoga mats especially if you want to strap them with the Velcro straps. As an alternative you can put the mat inside without attaching the straps and it won’t fall to the side. The Velcro straps will catch the towels if the Yoga mat is a bit bigger. 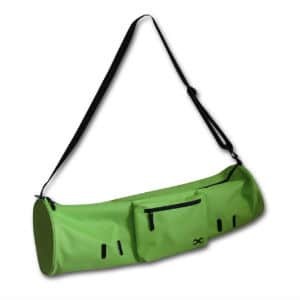 This YogaRat bag is made out of a 100% waterproof nylon fabric. Compared to other yoga bags on the list, the stitching on this fabric is well done. This bag comes with two padded shoulder straps which means that you can use it both like a backpack or if you would like, remove one of the straps, and use it like a mat sling. Furthermore, it has two small handles on the top and bottom to easily handle the bag. 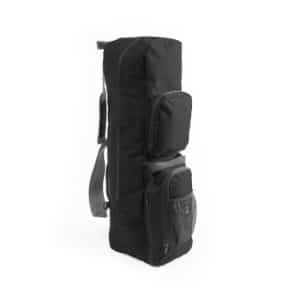 This bag is a bit smaller than the Yoga[Addict]™ and will only accommodate a Yoga mat of up to 26″x85″. Compared to other yoga mat bags on this list, this one has two zippered front pockets specifically made for Yoga blocks (9″x6″x4″) and other Yoga essentials. On top of the bottom pocket, there is a small mesh water bottle pocket. On each side, you will find two mesh vent panels and on the left side there is another pocket to keep small things like your cell phone/wallet. At around $30 this bag offers great value for the quality. It is a bit cheaper compared to Yoga EVO, but it offers the same amount of space. Your mat will also be fully protected from rain, you have more than enough space for your Yoga accessories and the sturdy material ensures that you will have this bag for a long time. So, for the price you are getting a great quality yoga bag. This is probably the only bag on the list that is great for heavy, sticky mats as it is easy to slide them in. Despite its size, it won’t fit a Manduka Pro Mat, though. The bag itself is pretty lightweight but strong and you can carry a lot of stuff without breaking it. You can comfortably fit Yoga clothes, a Yoga towel and bath towel, and your Yoga mat. You have the option to wear it as a backpack or, remove one of the straps, and sling it across your body for more comfort. The small padded piece on each of the straps will offer you additional comfort. The straps won’t leave marks on your shoulders. We gave this bag 4.5 stars because it is uncomfortable to wear it as a backpack. 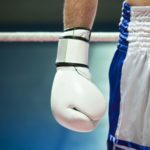 The two straps are attached with a ring at the top and you will feel an uncomfortable pinch in the neck and your shoulders especially if you are carrying a heavier mat. 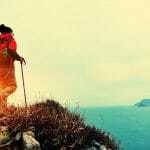 It is also uncomfortable if you run to your Yoga classes as it will swing back and forth. The straps are too long and loose. Because of this, the bag is also more suitable for taller people. If you are shorter, it may hang low and this yoga mat bag is not adjustable. This bag comes in 2 beautiful materials and a variety of colors from purple to denim: 100% Cotton Premium Ring Spun Denim and waterproof Heavy-Duty Polyester. The bag is 28”x8.3”, very light and easy to carry. It will fit your mat and small Yoga accessories with ease. The top of the bag has a Velcro flap to keep the Yoga mat inside. On the outside, there are two small zippered pockets to hold some of your personal items. Like the other bags in this list, this one comes with an adjustable shoulder strap. A $20 price point is a very reasonable price for a yoga mat bag such as the SAK. While not the best performing bag, this price is very affordable. The Sak is ideal for lighter Yoga mats. It generally won’t fit very thick mats (Manduka Pro, Jade) and larger mats won’t leave room for other stuff. With a smaller mat, you can fit in a Yoga towel. If you want to fit in very sticky mats, you will have to fight friction to get it into the bag. The lace on the top of the bag keeps sliding off so it is a good idea to tie a knot to keep the plastic lock (and your mat) into place. On closer inspection there were a few threads unraveling on the inside of the bag which got caught on the mat. The poor quality stitching means that the bag can rip apart if you overload it. The front of the bag has two nice-sized pockets which will fit your cell phone, wallet, IDs and a small bottle of water. Outside pockets should be a bit bigger and they should add a shoulder pad as it can leave your shoulders a bit red and sore if you carry the bag for long periods of time. YogaRat’s Mat Pak is one of those rare bags that will provide you with great quality for about a third of the money that you would normally spend on a bag from an established brand like Manduka or Gaiam. The main selling point of the Mat Pak is the fact that it will fit large and thick yoga mats like Manduka Black Pro or Lululemon, which are known to be difficult to get into normal bags. While most of the bags on the market are made from cotton or similar fabrics, Mat Pak is made out of 100% waterproof nylon which will allow you to carry this bag in any weather without worrying that your belongings will get dirty or wet. So far there are few bags that can match the price and the quality of this one. This bag has been designed with the Yogi in mind: the mats are easy to slide in, properly aired, the pocket can hold Yoga blocks and the bag is comfortable to wear if you are walking to the gym. All in all it makes it easier to fit Yoga into your daily routine. A good Yoga bag will be made out of a material sturdy enough to help you carry your Yoga mat and personal items to the Yoga class. 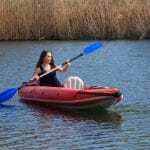 The material should be durable and waterproof, easy to clean, it should have eyelets or mesh to allow for ventilation and it should be comfortable when wearing. The shoulder strap shouldn’t leave any marks on your shoulders and it must have a pad for additional comfort. We also looked at how the bags are sewn to get an idea if they are likely to resist regular wear and tear. Most of the bags in our listing are made of nylon and cotton. Pricing on Yoga mat bags can vary from $20 to $100 depending on the material the bag is made from, size, the number of pockets and if the brand is established and focused on Yoga gear or not. All the bags in our review are mid-priced ($50) and we specifically looked for a balance between quality, space, and price. To see how each bag would perform we filled it up with different Yoga mats – regular size and large, different textures and stickiness, and some other accessories (keys, wallet, water bottle, t-shirt). We then carried it around town for about 15-20 minutes to see how light each bag would be on your shoulders and if it would break or inconvenience you in any way. We were looking for a Yoga mat bag that is easy to carry, has additional space for other Yoga class accessories, will protect your Yoga mat from sun, dust and mildew, and will air out after a Yoga session. Yoga mat bags will make a nice addition to your Yoga gear and the right bag will make the overall experience with Yoga much more enjoyable. In addition, Yoga mat bags will keep your Yoga mat from unrolling at the most inopportune time and will store your Yoga mat in between the classes. A good bag allows your mat to air dry after a Yoga session if you can’t immediately get home and will store all the necessary gear for the class. Trying to fit a Yoga mat into a traditional backpack can prove to be difficult and most of the times you will need an additional bag for other items. The same goes for Yoga mat slings which won’t protect your mat and don’t have any extra space for personal items. Yoga Mat Bags will keep your equipment organized and accessible. Yoga mat bags come in a variety of forms and materials from Yoga mat slings to Yoga mat carriers, tote bags and over the shoulder bags. Yoga Slings are compact, easy and quick to use, and will transform your Yoga mat into a bag. They will allow your mat to fully dry in between classes. Yoga over-the-shoulder bags will fit and cover any mat and are equipped with adjustable straps and pockets for any additional Yoga gear. Yoga tote bags are more compact and have enough space to fit your Yoga mat, towels, clothes and extra pockets for other small items like cell phones and keys. You can choose from a variety of designs depending on your personal preferences and fitness needs. Yoga mat bags have different sizes depending on the type of mat you use for your training. If you are just starting to train you will probably have a regular 24” wide mat, which will comfortably fit into a large 27” or 28” bag. You can also carry these mats using a sling or a tote bag (where you would attach these mats onto the mat holder in the front). As you advance in your training you will probably want to buy one of the larger and thicker pro mats which are heavier (up to 4.7 kg without counting for your personal items) and for which you will need an extra large bag made out of a solid material.